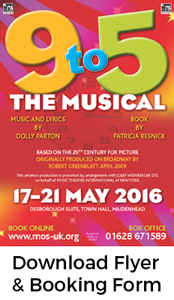 9 to 5 The Musical – Based on the 20th Century Fox Picture & Originally produced on Broadway by Robert Greenblatt, April 2009 Show runs from the 17th to the 21st May. 7:30pm at the Desborough Suite, Maidenhead Town Hall. Tickets £10 for under 16, £15 for concessions (Tue & Sat only) & £16 full price. Synopsis & Info Three unlikely friends take control of their office and learn there is nothing they can’t do, even in a man’s world. 9 To 5 The Musical, with music and lyrics by Dolly Parton and book by Patricia Resnick, is based on the seminal 1980 hit movie. Set in the late 1970s this hilarious story of friendship and revenge in the Rolodex era is outrageous, thought-provoking, and even a little romantic. Push ed to the boiling point, three female co-workers concoct a plan to get even with the sexist, egotistical, lying, hypocritical bigot they call their boss. In a hilarious turn of events, Violet, Judy and Doralee live out their wildest fantasy – giving their boss the boot! While Hart remains “otherwise engaged,” the women give their workplace a dream makeover, taking control of the company that had always kept them down. Hey, a girl can scheme, can’t she? Show week at The Desborough Suite starts with Get In/Band Call on Sunday 15th May and ends the following Saturday.